485/1 NHL Mega Odds, 17/1 Acca & Double all land on Tuesday night!! An incredible start to the new year by our NHL Analyst!! 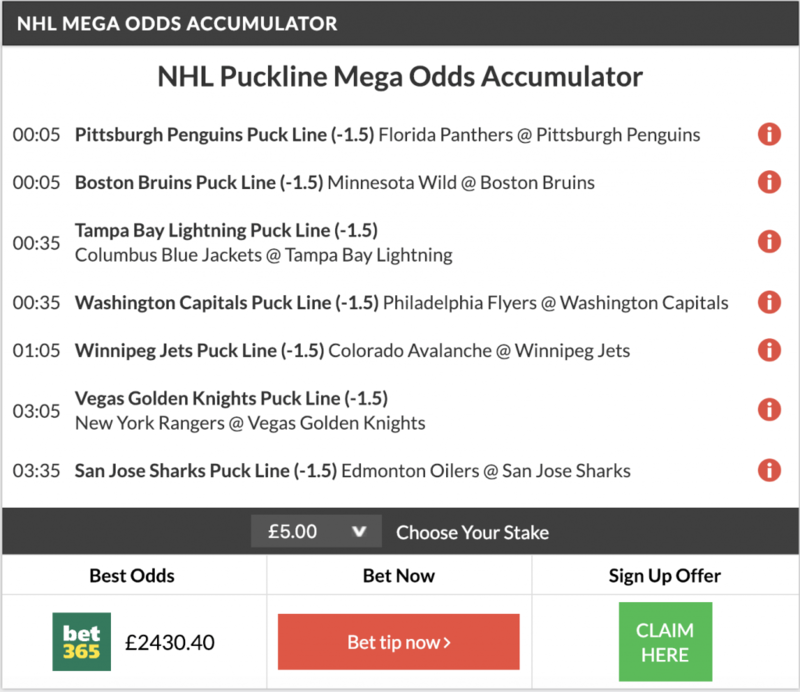 One of our biggest Accumulator winners ever came in last night as we landed a 485/1 Mega Odds Accumulator on the NHL! The clean sweep was finished off by us landing the 17/1 Acca & Double as well! The night started off with the Penguins taking on the Panthers and we needed Pittsburgh to win by 2 or more goals. It was a fairly one sided game here as the Penguins took a 2-0 lead after the first period and they pushed that to 4-1 after the 2nd. In the end it finished 5-1 for our first winner on the Acca. It was a similar scenario in the 2nd game as well with the Boston Bruins taking on Minnesota. They were 3-0 up after the first period and the game was pretty much decided after they went up 4-0 in the 2nd period which was the final score here. Tampa Bay dominated the Columbus Blue Jackets 4-0 in the 3rd game of the Acca. Winning the first & 3rd periods by 2-0 got the job done for their 33rd win of the season. A huge 2nd period by the Washington Capitals decided their game against the Philadelphia Flyers. After the two teams went into the first break tied at 1-1 it was Washington who scored 3 goals without reply in the 2nd period to give themselves a solid lead. In the end they were able to hold on and win 5-3! The Winnipeg Jets put 7 past Colorado in what was a thrilling encounter. It was 4-3 Jets heating into the 3rd period, but a 3-1 score in the final 20 mins of the game got us one step closer to a massive boom here! The game between the Rangers and Vegas Golden Knights was a close one. The Knights went up 3-0 after two periods, but the Rangers fought back to make it interesting. However, our team managed to score 1 more goal in the final period to land our tip in this one and to win their 7th game in a row! And finally the San Jose Sharks scored an easy home win against the Edmonton Oilers. It was 5-2 after the first 20 mins and the game was pretty much settled. Two more goals in the 3rd ensured an easy win for San Jose, but more importantly landed our 485/1 Mega odds acca!!! Our FREE NHL TIPS page features Accumulators, Mega Accumulators, Doubles & Bet of the Day tips! Be sure to bookmark that page so you don’t miss out on any future winners! Categories: Big Wins, NHL, and Tip Results. Tags: ice hockey, NHL betting tips, NHL match preview, and NHL predictions. Sports: NHL.